Abraham Lincoln facts for kids brings an exciting collection of facts regarding one of the greatest U.S. Presidents. So let’s dive deep into the personality of Lincoln and read all about Abraham Lincoln! The political career of Lincoln was started in 1834. As a member of the Whig Party, he was elected to the legislature of Illinois state. He was the only Whig member from the state of Illinois. He began to study law all by himself through reading “Commentaries on the Laws of England” by William Blackstone. During 1847 and 1849, Lincoln became a member of the U.S. House of Representatives. 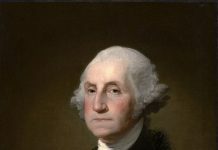 Today, he is regarded as one of the greatest leaders in the history of the United States. Now let’s learn more about him and explore some of the interesting facts about Abraham Lincoln! The U.S. President Abraham Lincoln was the fourth great-grandson of Samuel Lincoln. Samuel Lincoln (1622 – 1690) was born in Hingham, Norfolk in England. He worked as a weaver under Francis Lawes of Norwich, England. In 1637, Samuel left England and embarked on a voyage to the Massachusetts Bay Colony. The name of his ship was John & Dorothy. The older brother of Samuel Lincoln was “Thomas Lincoln the Weaver”. Thomas (Samuel’s brother) had come to Hingham, Massachusetts in 1635 and had a house there. Since Thomas had no children, he gave all of his property to his brother, Samuel Lincoln. Samuel Lincoln had eight children who had survived to their adulthood. These are Samuel, Daniel, Mordecai, Mary, Thomas, Martha, Sarah and Rebecca. One of the grandsons of Samuel Lincoln was also named Mordecai Lincoln (1686 – 1736). In Pennsylvania, Mordecai was a well-known landowner of means. Mordecai had married to Hannah Salter. They had a son named John Lincoln (1716 – 1788), who settled in Virginia. John Lincoln built a large farm and gave away 210 acres of land to his son, who was a military captain named Abraham Lincoln I (1744 – 1786). This Captain Abraham Lincoln was the grandfather of Abraham Lincoln, the U.S. President. John Lincoln was, therefore, the great-grandfather of the U.S. President. In 1681, Samuel Lincoln built a church in Hingham, known as Old Ship Meetinghouse. Today, it is the only surviving church that dates back to the 17th century in North America. The father of Samuel Lincoln was Edward. Edward died in February 1640. He stayed in England’s Hingham which is why his gravesite is located at St. Andrew’s church in Hingham, Norfolk. Today, the church of St Andrew’s of Norfolk, England displays the bust of the U.S. President Abraham Lincoln. The eldest son of Cap. Abraham Lincoln was Mordecai Lincoln (1771 – 1830), the uncle of the U.S. President. Thomas Lincoln was a carpenter and farmer. He was born in Virginia in 1778. Thomas could not write but he was widely known for his honesty. He was an active church member. Thomas was held in high regard for his ability of storytelling and good nature. Thomas’ father, Abraham Lincoln I, was the Captain in American Revolutionary War. In May 1786, American Indians killed Lincoln I. At the time of murder, Lincoln I was working on his farm along with his three sons namely Thomas, Mordecai and Josiah. Thomas was eight years old at the time. As he turned 19, Thomas was entered into state militia. In 1803, Thomas purchased a farm in Hardin County, Kentucky at a cost of 118 pounds. The farm had a size of 238 acres. Thomas got married to Nancy Hanks on June 12, 1806 in the Washington County, Kentucky. Thomas purchased another farm in 1809 at Nolin Creek. Its size was 300 acres. After the death of Nancy Hanks, Abraham Lincoln had a troubled relationship with his father. Nancy Hanks Lincoln was mother of Abraham Lincoln. She was born on February 5, 1784 in Hampshire County, West Virginia. Today, it is known as Mineral County. She was raised by her grandparents, Anne and Joseph Hanks. But her grandfather passed away when Nancy was only 9. In March 1784, Joseph Hanks moved to Kentucky along with his family and Nancy. After the death of her grandfather Joseph, Nancy began to live with her mother, Lucy Hanks Sparrow. About two years before, Lucy Hanks had already married to Henry Sparrow. Elizabeth Hanks was the sister of Lucy Hanks. Nancy went to live with Elizabeth after her marriage in 1796 with Thomas. Nancy used to call them “mother and father” because she was very close to Elizabeth. In the house of Elizabeth, Nancy learned new skills of cultivating crops so that she could cater for the food of her family. Lucy Hanks married to Thomas Lincoln on June 12, 1806. The marriage had taken place at a 2-story-log house called Richard Berry Jr. House in Springfield, Kentucky. Lucy and Thomas had three kids namely Sarah Lincoln, Abraham Lincoln and Thomas Lincoln Jr.. Thomas Jr. died in early childhood. Nancy died on October 5, 1818. Abraham Lincoln was only 9 years old while Sarah was 11 years old. She is now buried in the Pioneer Cemetery. The place is also named after her, the Nancy Hanks Lincoln Cemetery. His birth took place on a log cabin of one room close to Hodgenville, Kentucky. The mother of Abraham Lincoln died possibly because of milk sickness. At the time, Lincoln was only 9 years old. After the death of Lincoln’s mother in 1818, Thomas (father of Abraham) married to Sarah Bush Johnston the following year. Lincoln used to call his stepmother as “mother”. As a young boy, Lincoln did not like hard manual labor. He was fond of reading and writing. For the most part, Lincoln was self-educated as he did not have round-the-clock formal schooling. During his teenage, he was involved in routine chores of his house and he used to give all of his income to his father. It was a well established practice for a boy to hand over his income to his father. He was tall (6.4 feet), strong and by this time he had learned the skills of using axe. He was well known for his physical strength thanks to the wrestling match he had had with the leader of the scoundrel group known as “the Clary’s Grove boys”. At the age of 23, Lincoln purchased a general store in New Salem, Illinois in partnership. Today, the village has been reconstructed and it is known as Lincoln’s New Salem State Historic Site. Lincoln had served as a captain in the Black Hawk War (conflict between Native Americans and United States) in the Illinois Militia. It was probably Lincoln’s stepmother, Sarah Bush Lincoln who motivated the young Lincoln to read. Lincoln did not have regular formal schooling. He had a formal education for about 18 months. When the Lincoln family moved to Perry County in Indiana, there was not enough available resources for reading. The young Lincoln had to go miles on his feet in order to have a book to read. Mary Ann Todd Lincoln was the wife of Abraham Lincoln. She was the fourth child of Robert Smith Todd and Elizabeth Parker. She was born in Lexington, Kentucky. Her father was a banker. The family of Mary owned slaves—the reason why she spent her entire life in comfort. She belonged to an affluent class of Kentucky family. Her mother passed away when she was only six years of age. Following the death of her mother, her father married to Elizabeth Humphreys. Mary was a well educated woman. The paternal great-grandfather of Mary was born in Ireland. His name was David Levi Todd. Samuel McDowell was the great-great maternal grandfather of Mary. He was born in Scotland and then moved to Pennsylvania. The remaining progenitors of Mary were from England. She was fluent in speaking French and also learned music and dance. At the time of her marriage, she was ten years younger than Abraham Lincoln. Four children were born to Abraham and Mary but only two of them lived up to adulthood. The early home of Mary Todd is now known as Mary Todd Lincoln House. This is the historic site and it is widely known for being the girlhood home of the First Lady of the United States. The house was an inn, at first, when it was built in around 1806. Before becoming the house of Todd family, it was called “The Sign of the Green Tree”. In 1832, the Todd family moved in this house. It was a three-story home. Mary lived here from 1832 to 1839. It has now turned into a museum. The museum contains fourteen rooms along with the artifacts of Todd family. Ann Todd was the younger sister of Mary. When she was born, Mary stopped using the name Ann. Following her marriage with Abraham Lincoln in 1842, Mary dropped the word Todd from her name. Lincoln and Mary had four children: Robert, Edward, Willie and Tad. A portrait of Robert Todd Lincoln, the only Lincoln’s son to survive up to adulthood – Image by John Goldin & Co.
Robert Todd Lincoln was the eldest son of Abraham. He became a politician and lawyer. He was the only son of Lincoln who had survived up to adulthood. In his entrance exams of Harvard University in 1859, Robert had appeared in sixteen subjects. But he was passed in only one subject. After graduating from Phillips Exeter Academy in 1860, Robert was entered into the Harvard College, from where he was graduated in 1864. Finally, Robert joined the American Civil War during the final days of the war, as a captain. He was the second child of Abraham Lincoln. Edward was named after a friend of Lincoln, Edward Dickinson Baker. His nickname was “Eddie”, which was inscribed on his gravestone. Eddie was born on March 10, 1846 in Springfield, Illinois. However, he had died at the age of three years. He was a good-natured boy with loving disposition. It has now been put forward that Edward died due to medullary thyroid cancer. According to census records, however, the cause of Eddie’s death was tuberculosis (chronic consumption). Eddie was buried in Hutchinson’s Cemetery in Springfield. He was a third child of Lincoln and Mary Todd. He has a nickname “Willie”. Willie was named after brother-in-law of Mary Todd, Dr. William Wallace. Both Tad and Willie used to be hellions in Springfield. They had a habit of turning the books upside down in their father’s law office. In 1862, both Tad and Willie became ill.
Willie died in the White House on February 20, 1862. The possible cause of his death was typhoid fever, which was caused by the contaminated water from the Potomac River. The death of Willie devastated the parents. Lincoln used to shed tears alone in his room in memory of his lost son. Mary was even more heartbroken than Lincoln on her son’s death. Tad in military uniform – Author of the image: Brady, Mathew B., 1823 (ca. )-1896, photographer. He was the youngest son of Abraham Lincoln. His father used to call him “Tad” because according to him, Thomas was “as wiggly as a tadpole”. Thomas had a large head with small body. He was an impulsive child. Thomas was named after his uncle and paternal grandfather, Thomas Lincoln. Tad had speech problems since his birth that had continued for the rest of his life. This was due to a condition known as “cleft lip and palate”. Due to this, Tad used to utter words in haste and often without any forethought. He had uneven teeth which was why there was a special meal for him. During the lifetime of Abraham Lincoln, Tad did not have any formal schooling. In the White House, he was free to go anywhere particularly after Willie’s death. At times, he was found to barge in meetings of the President and sometimes, he was involved in collecting animals. Tad died at Clifton House hotel in Chicago on July 15, 1871. He was 18 years old. The possible causes of his death are tuberculosis, heart failure or pneumonia. Lincoln was elected as the 16th U.S. President on November 6, 1860. His election rivals were Bells, Douglas and Breckinridge. Abraham Lincoln was the first Republican Party President. The North and West casted votes for Lincoln in 1860 election and it was due to their support that Lincoln eventually became the U.S. President. The slave states in the South did not vote for him. Out of 15 states in the south, 10 states did not give any vote to Lincoln. In all, there were 996 counties in the south. Out of these, Lincoln won in only two counties. Lincoln got 1,866,456 votes in the election. After the Lincoln’s victory, South Carolina was the first state to break away from the United States on December 20, 1860. In all, the seven slave-holding states adopted an independent constitution and declared themselves to become the Confederate States of America or Confederacy in 1861. At the start of the Civil War, North Carolina, Virginia, Tennessee and Virginia also became part of Confederacy. The Confederacy had selected a provisional President named Jefferson Davis on February 9, 1861. President Lincoln declared the Confederacy to be illegal. The Gettysburg address is one of the most famous speeches of Lincoln. Today, it is widely known as one of the finest and most quoted speech in the history of the United States. It was delivered after about four months from the Battle of Gettysburg in July 1863. The speech was given at the dedication ceremony of Gettysburg National Cemetery on November 19, 1863. In this address, Lincoln emphasized on the equality of all humans as declared by the founding principles in the Declaration of Independence. Besides, he also expressed the purpose of civil war i.e. to preserve the Union. The “score” in the above phrase means 20 and adding seven to that number makes a total of 87. Lincoln was actually referring to the Declaration of Independence which was signed eighty-seven years back. The speech lasted for about 2 minutes. There were 273 words in that address. It is probable that half of the Gettysburg address was written by the President in the White House, on November 18. Lincoln went to the Gettysburg with Secretary of State, William H. Seward. The Gettysburg Address is now an important aspect of American culture. Lincoln gave this speech to a crowd of 15,000 people. This Lincoln’s speech is carved out in the south wall of the Lincoln Memorial in Washington D.C., behind the statue of Abraham Lincoln. Before the start of the Lincoln’s address, Edward Everett gave his speech that lasted for two hours. Everett was educated at Harvard and was among the finest orators of America in the period of civil war. His speech contained more than 13,000 words. B. B. French composed the hymn for the occasion. May 18, 1860 – Lincoln became the candidate from the Republican Party for the U.S. President in Chicago convention. January 1, 1863 – Lincoln issued the Emancipation Proclamation order. This order set at liberty at least three million slaves of the ten southern states. It was issued to put down the rebellion in the south during the civil war. This house is located in LaRue County, Kentucky. The parents of Abraham Lincoln moved to Sinking Spring Farm in 1808. A baby Lincoln was born in a one-room log cabin of this house after two months of his parents’ arrival. The Memorial building holds a log cabin similar to the one in which Lincoln was born. It is a symbolic log cabin, not the original one. The original log cabin in which Lincoln was born was pulled to pieces in around 1865. Sinking Spring Farm was the homestead of Abraham Lincoln for up to 2 years from his birth. The memorial building was designed by an American architect, John Russell Pope. He has also designed the Jefferson Memorial, which was built in 1943. The cornerstone of the memorial was laid by the 26th U.S. President, Theodore Roosevelt. The dedication ceremony was held in 1911 and it was dedicated by the 27th U.S. President, William Howard Taft. 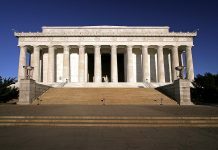 Since Abraham Lincoln was the 16th U.S. President, the design of the building represents quite a number of symbolic features. For instance, there are 16 rose-shaped designs on the ceiling of the memorial as well as 16 fence poles and 16 windows. Abraham Lincoln died at the age of 56. For that reason, the entrance of the memorial has 56 steps. The Abraham Lincoln National Park was built in July 17, 1916. In 1933, this park was given under the administration of National Park Service. On August 11, 1939, the park was named as Abraham Lincoln National Historical Park. It was renamed again on September 8, 1959 as Abraham Lincoln Birthplace National Historic Site. At the age of two years, Lincoln moved to another farm known as Knob Creek Farm. He lived here from 1811 to 1816. This farm was added to the Abraham Lincoln Birthplace National Historical Park in 2001. The total size of the farm is 228 acres. But the Lincoln family lived on 30 acres of the site. Knob Creek is the birthplace of Lincoln’s brother, Thomas. However, this is also the place where he had died. Abraham Lincoln had almost drowned in the water of this farm. Nevertheless, as luck would have it, his friend Austin Gollaher came to the aid of Lincoln by extending the branch. Knob creek farm contains two historical structures: the Gollaher Cabin and the Lincoln Tavern. The Tavern is a 1.5-story building. It was made up of logs in 1933. The Gollaher cabin is the home of the family of Austin Gollaher. They lived in this cabin when they were at Knob Creek Farm along with the neighboring Lincolns. It was made in 1800. The cabin has been moved here afterwards. This memorial is located in the Lincoln City, the Southwest part of the U.S. state of Indiana. Lincoln lived on this farm site from 1816 to 1830. He was seven years old when the Lincoln family moved here. Nancy Hanks Lincoln (Lincoln’s mother) is buried in the Pioneer Cemetery of this site. In 1960, this home was named as the National Historic Landmark. The park also features Lincoln Living Historical Farm. The site has 15-minute short film for the visitors about the President’s stay in Indiana. The site contains a one-story building made up of limestone. It was completed in 1945. The building contains five panels showing different stages in the life of Abraham Lincoln. “The authors of the Declaration of Independence never intended ‘to say all were equal in color, size, intellect, moral developments, or social capacity’, but they ‘did consider all men created equal—equal in certain inalienable rights, among which are life, liberty, and the pursuit of happiness’. Abraham Lincoln was born in a one-room log cabin in Hardin County, Kentucky. His birth took place at Sinking Spring Farm, close to Hodgenville. With 6 feet 4 inches tall, Lincoln was tall and physically strong. He made a living through manual labor. He was adept at cutting logs with an axe and made a living by collecting woods for rail fencing and fire. At New Salem, Illinois, Lincoln did various jobs like postmaster and shopkeeper. 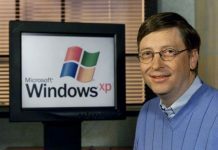 He also became a partner in a small general store. Abraham Lincoln became the U.S. President on March 4, 1861. By the time he was murdered on April 15, 1865, he was the second-time president of the U.S. But his second term in office had just started (42 days had gone by).